It's hard to imagine the downside to keeping a giant reptile with a nasty temperament as a pet, but today we have a cautionary tale from Kansas. 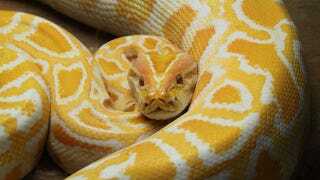 Chrystal Wilson was feeding her eight-foot-long albino python yesterday when it clasped its jaws around her neck. A child called the police, and when officer Max Bryant arrived at the scene he pried the snake's jaws apart with his hands. He'll get a citation for bravery, and Wilson has been charged with a misdemeanor for harboring a vicious animal.